We had a great inaugural season of Trash Fishing. 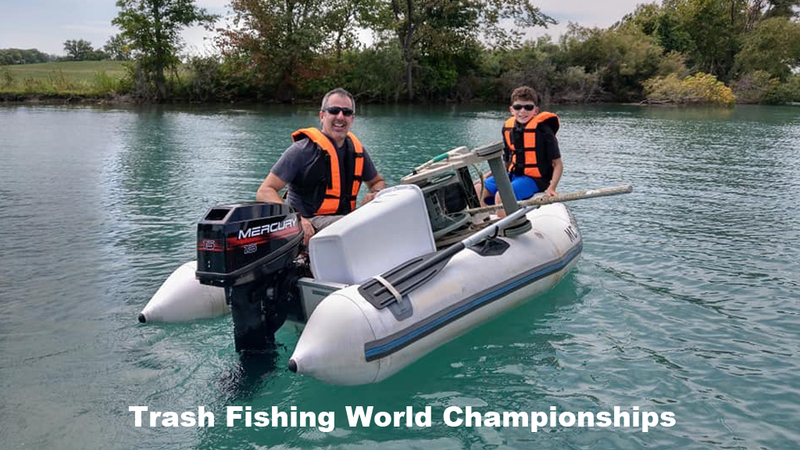 In 2018 Mark came up with the idea for Trash Fishing, we talked about it and decided to buy a little boat. It was a new experience for both Mark and I, but it seemed like a great idea. From our first voyage we realized we had a good idea. There was lots of trash and it was fun to grab it. It didn’t take long for us to realize that we should invite other people to join us, so we did. Now Trash Fishing is a fun activity we share with friends both new and old. To finish up the year, we put all of our favorite video clips into this one video. Hopefully 2019 is going to be an even better year for Trash Fishing. We’ve got a new (to us) boat and a little bit of money to plan some great events. Check our Facebook events page to see exactly what we are up to. Exciting News! Boston Whaler, yup, that Boston Whaler, has joined us as a Corporate Partner. What does that mean? Well, we don’t really have a lot of needs right now, and we don’t really have a lot to offer, but our hearts are in the right place and we have a big problem to tackle. With all of that in mind, we asked the folks at Boston Whaler to help us with our plans. In 2019 we plan to throw some great Trash Fishing events and possibly pull 2,000lbs of trash out of the water. While we do this, we want to look good, so we asked for some Boston Whaler gear. In 2020 we want to plan Trash Fishing events all over and the folks at Boston Whaler can put us in touch with their dealers everywhere. It sounds like a great partnership to us. In the video above you can see us opening all of the gear. We’ll put it to work this season and if we gather enough attention and enough trash, those 2020 plans will fall into place. There is a national contest for school aged children to create and inspirational video. The contest is called Reflections. This year Mark submitted this video to it. We recently raised some funds so that we can throw some awesome Trash Fishing competitions in 2019. Our goal was very reasonable and we promised to spend the money wisely. We raised just enough to host some trash fishing events and provide people that attend these events with free donuts and free trash grabbing tools. We will also have a bit of money to make shirts for people that come trash fishing multiple times. It is certainly going to be a lot of fun in 2019. We hope you will check our Facebook page for an event that you can attend. We launched from a new spot this time. We put in at the St. Jean boat launch on the Northern end of Detroit, near Belle Isle. From there we patrolled both sides of the Detroit River looking for trash. On the land side we found a hose reel, trash, barrel and some other stuff. On the Belle Isle side we found underwear, diapers, a car tire on the rim, and a boat oar. We also found a bunch of trash to pick up. It was a great day of Trash Fishing. Mark’s twin sister Margot came out with us for the first time. Charlie and Jesse did too. When we started Trash Fishing we knew that if it was fun we would try to get other people to join us. Well, it is fun, and we want other folks to enjoy it too. Tom’s idea was to hold Trash Fishing Contests because contests are always fun. So, we held the first ever Trash Fishing Contest to see who could find the most, the most unusual, and the biggest piece of trash. We also awarded a “World Champion” award to the person who had collected the most trash all season.